One of the highest civic honours has been awarded in memory of a toilet attendant who befriended prostitutes. 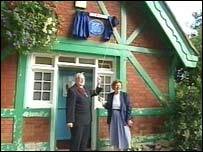 A blue plaque for Victoria Hughes was unveiled on Monday at the public toilets on the city's downs, where she worked for more than 30 years. Mrs Hughes started work there in the late 1920s and turned the area round the conveniences into a safe haven for Bristol's working girls. Speaking shortly before she died in 1977, Mrs Hughes said she wanted to be like a mother to the girls. She said she would never condemn the girls, adding that many were very poor and had hard lives. Speaking at the ceremony on Monday, retired journalist David Foot, said: "She had this lovely ability to listen to them, to pour the tea for them and to encourage them to talk to her. "She was a companion apart from anything else and a wonderful social worker without realising it."